Texas poker card scanner and playing cards scanning system are used to predict the outcome of texas holdem and omaha games. 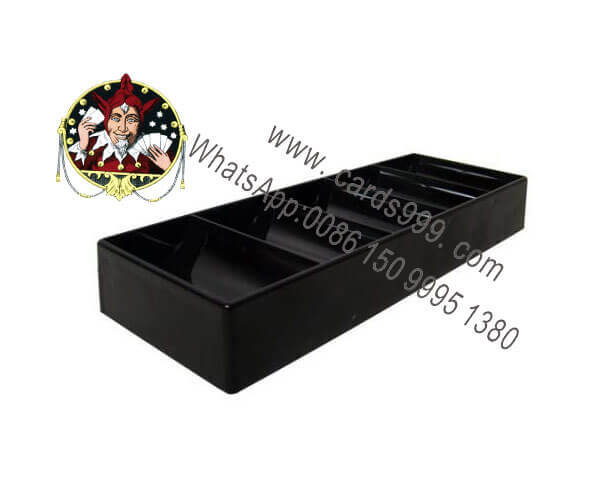 200 chip tray , Texas poker table chip tray is used as chip holder, normally for 4mm poker chips. Black or transparent poker scanning camera, it is a kind of useful playing card game scanner camera. Our professional technician can install a mini camera inside the front side of chip tray, and when you run the poker analyzer, it can scan the side marked playing cards. It can be put on the table, also some people call it poker table scanner camera. It is a card cheating device that can work with all signal frequencies, such as MDA and V68 poker scanners, Samsung playing cards scanner system, CVK poker scanning system, AKK holdem and omaha poker winner predictor. If you are a Dealer, you can choose 8-15cm, 10-25cm,20-40cm. If you are a poker player, you can choose 30-50cm, 40-60cm, 50-70cm,60-80cm, and also 70-90cm. The reacting time is within 0.5 second. You can put the analyzer marked cards on the table, and turn on the chip tray camera.